← Christmas in Nineteenth-Century Bideford. Many thanks to Mr. Freddie Palmer, who provided these photos. We’re sure that they’ll be of interest to many people. 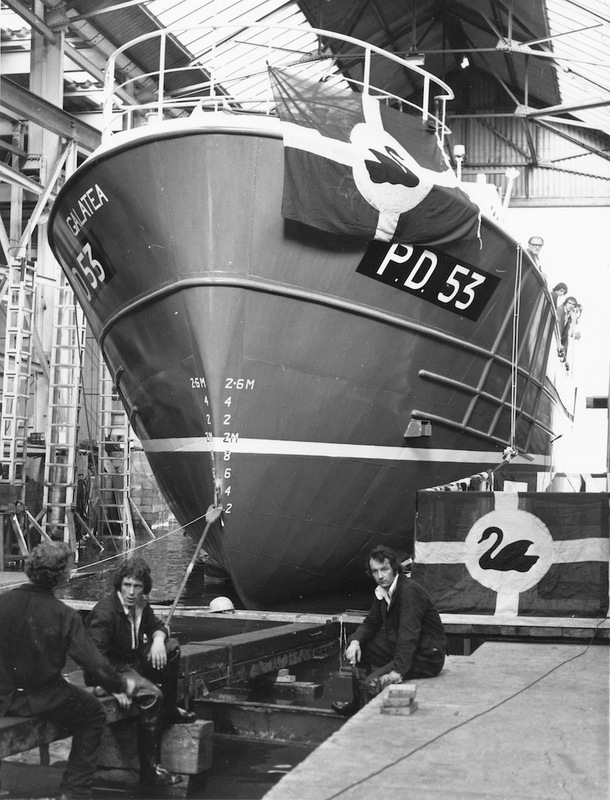 “Buzz” is dating the photos of the trawler “Galatea” as 1975, since records show that as date of launch. Names supplied by Freddie Palmer & Kenny Davis. Any further photos for publication would be welcomed, as would memories of the Shipyard’s history. 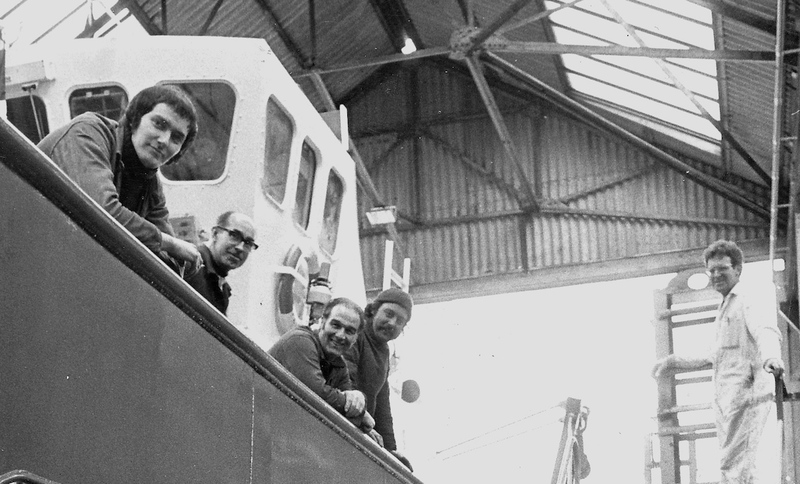 Above, L-R : Phil Pester, Harold Braund, Bill ‘Bimbo’ Hocking, Fred Palmer, Matty Blackmore. 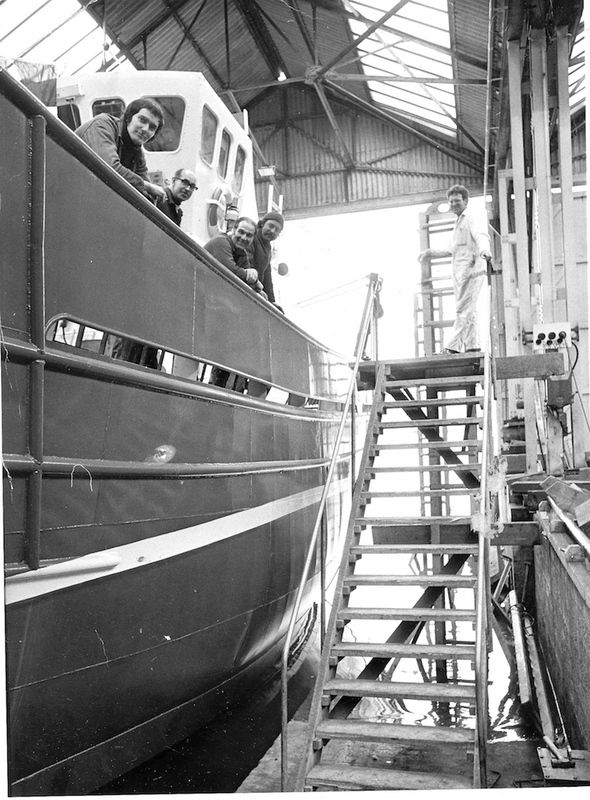 Above, L-R on deck : Alan Tuplin, ?, Phil Pester. on slipway : ?, Colin Pennington, ?. L-R : Des Roberts, Raymond Garrard, Matty Blackmore. “Buzz” shipping correspondent Norman Hardaker has supplied a schedule of vessels launched at Bideford Shipbuilders between 1966 & 1975 (listed as Name, category, & displacement). Isle of Gigha / Sound of Gigha – ferry, 60.35 tons. Fregata – fishing, 44.8 tons. Sagitario – fishing, 44.8 tons. Ibis – fishing, 44.8 tons. Nocella – fishing, 22.17 tons. Hasa Hasa – fishing, 40 tons. Joanna C – fishing, 25 tons. Don Bosco – fishing, 24.9 tons. Polo – barge, 41.22 tons. Our Tracey – fishing, 25.11 tons. Barbarella – fishing, 25.11 tons. WB.01 – WB.05 (5 vessels) – work boats, 25 tons. Gull – pilot, 22 tons. 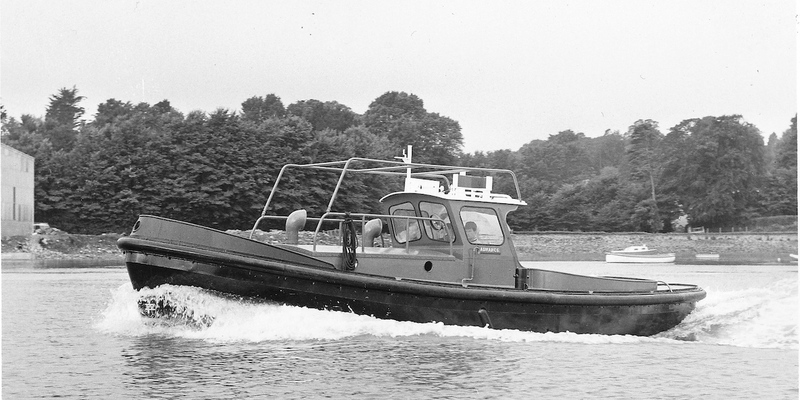 Miss Anna – tug, 83.21 tons. Miss Debbie – tug, 83.21 tons. Guardwell – customs, 30 tons. Tri Star – passenger, 42.8 tons. Polo II – hopper barge, 58.29 tons. Peter David – passenger, 17.11 tons. Golden Mariana – passenger, 40 tons. Grima – ferry, 147.76 tons. RNLB City of Bristol – lifeboat, 90 tons. Langdale – trawler, 102.5 tons. Majestic – trawler, 102.5 tons. Solent Scene – passenger, 50 tons. Vision – trawler, 102.5 tons. 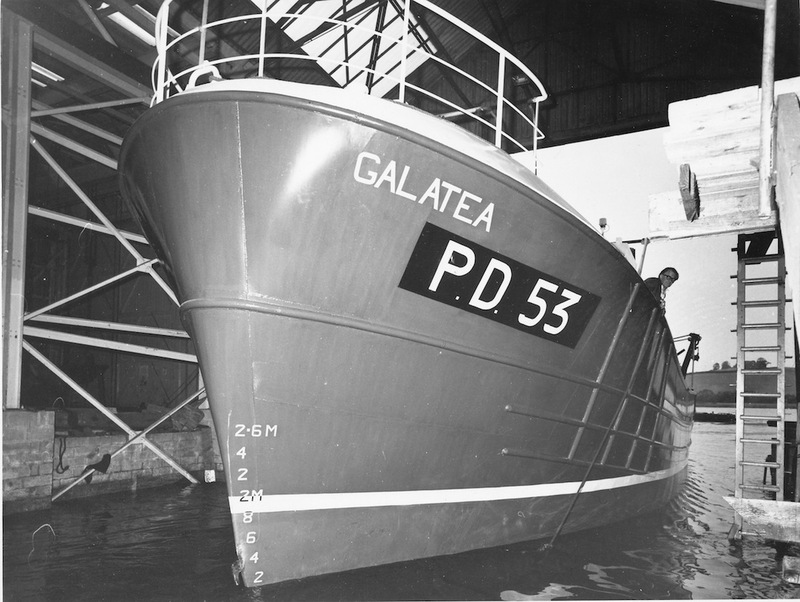 Galatea – trawler, 102.5 tons. For photos and information on some of the vessels on the above list that are still in use, link here. (By kind permission of ShipPhotos). Happy Hours at the Bideford Ship Yard. 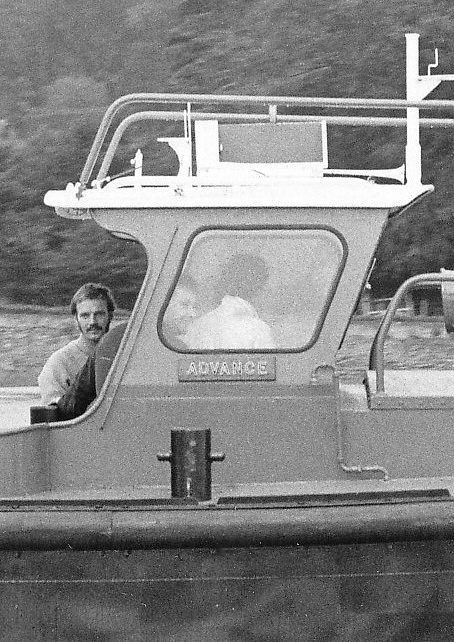 If I ever had the joy of ‘happy hour’ in my long working life, it has to be the two and a half years at Bideford Ship Yard, between coming home from the Dark Continent in 1972 until August 1974 when again returning to the African Veld. At the Bideford Yard in those far off days we didn’t get as much on the hour compared to the big yard a mile down river, but we had plenty of daily laughs and a pleasure to go to work. Looking at the front cover of the February edition showing photos of the former yard sent in by Fred Palmer (well done that man) – and yes, I do recognise most in the photo – Harold Braund, Bimbo Hocking, Fred Palmer, Mattie Blackmoor, can be seen standing on the nearby platform; in the second photo I can recognise Alan Tuplin, and further in the middle of three Bogey Clover, Colin Elliot and Steve Wicks. Kenny Davis – Blacksmith. Retired. This entry was posted in History, Local People, Shipping and tagged bideford, Bideford Shipyard, river Torridge, shipbuilding, shipyard, Torridge shipyards. Bookmark the permalink. 2 Responses to Memories of Bideford Shipyard. How nice to read this and bring back some very happy memories. I have a scale model of Tarquin Grove which was built at the yard . I would like to gift it to a local museum if possible?